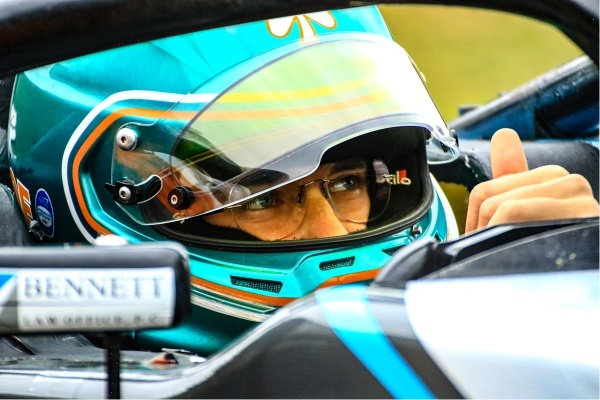 April 7, 2019 – Taking on the Barber Motorsports Park facility in Birmingham, Alabama, James Roe Jr. secured a pair of top-ten results in his series debut. After a fourth place finish on Saturday in race one, the Global Motorsports Group entry added a seventh place result on Sunday in challenging track conditions. After progressing through the Promoters Test day on Thursday and official practice sessions on Friday, Saturday was the home for qualifying and race one on the weekend. Piloting his CJJ Motorsports / Topcon Positioning Group / The Vortex Companies / Bennett Law Office / Global Motorsports Group #95 to a fifth place result in morning qualifying, Roe was able to rocket off the line and jump into the top-three early on in the race. With lap times from race one setting the grid for race two, James Roe Jr. kicked off Sunday’s wheel to wheel action from outside row three in the sixth position. With all the F3 Americas Powered by Honda series drivers taking the green with wet weather Hankooks, Roe stumbled off the line and was immediately attacked by several hungry competitors. After breaking a front wing on lap five and falling back to the tenth position, Roe kept his head down, pushing each and every lap. With a drying track and some smart strategy calls by his Global Racing Group team, Roe closed his first event weekend of the season with another top-ten result in seventh. The next event on the 2019 F3 Americas Powered by Honda calendar is in less than two weeks at the famed Michelin Raceway Road Atlanta over the April 18-20 weekend. Competing alongside the F4 United States Championship Powered by Honda program, James Roe Jr. will continue to push towards the front of the field with the goal of a podium result.